Present a deserving couple a gift that reflects their quality time, together. Featured for sale here, is an elegant pair of two identical timepieces, for him and her, with only diameter differences. 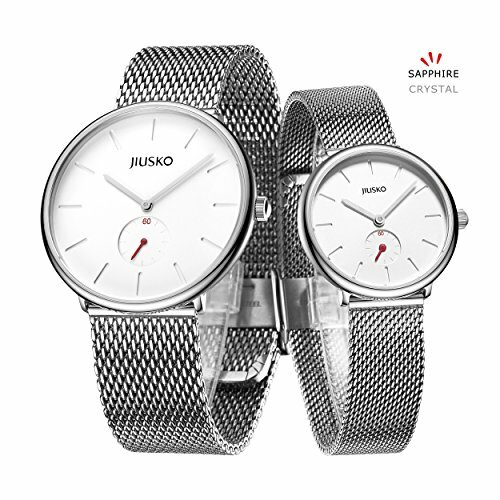 Minimalistic, classy and easy-read are positive attributes to Jiusko's newest mesh collection. Specifications meet Jiusko's promising standards of top quality. Enjoy a scratch-free glass that only Sapphire Crystal offers, Japanese Miyota Analog Quartz Movement, High grade stainless steel, nickel-free and hypoallergenic and of course Water Resistant up to 30 Meters. Indeed, presentation matters! Lovingly presented in a red suede heart-shaped box with the paperwork and Jiusko's 5 Year warranty card. Need more information? call us today 800-555-JIUSKO. If you have any questions about this product by JIUSKO, contact us by completing and submitting the form below. If you are looking for a specif part number, please include it with your message.